My grandparents…a year before my mother was born and 6 years before they were divorced.. Sometime around 1900. This is the grandpa who took me to the circus, the one with the long earlobes. Grandma Dora lived with us when I was born, when my sister was 10. The three of us shared a bedroom with two windows facing the court yard from the third floor. I never knew her with dark hair, her hair was very white short and curly. What I remember is standing between her knees in the living room while she brushed my hair and pulled me as she braided it. She wore stockings that were rolled just below her knees and kept a pack of tobacco for rolling her own cigarettes. She was warmand I imagined she read to me but was told later that she could not have as she never learned to read English. Originally from a place called Bialistoc, which I was told was in Russia at the time and maybe later became part of Poland. 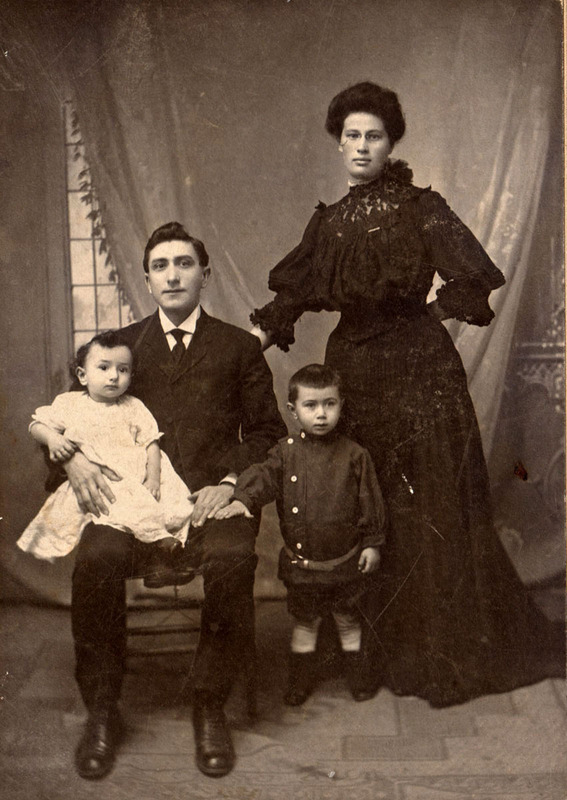 Grandma Dora came to the United States with many other immigrants sometime in the late 1800’s. I found her name on the ships manifest once, Brody there was her mother who’s name I can’t remember right now, her sister Mary brother Ben and another brother that must have died young because I never heard of him. The stories I heard about her were that she loved to dance and danced with scarves, she had lovers one who is in the box with old photo’s, my mom said they used to call him uncle somebody. Dora and Louie divorced in an age when it was not an everyday occurrence. They lived in Brooklyn, but before that they lived on farm land in Connecticut, my mom remembered it being too cold in the winter. My mom was an avid reader and spend much time in the library as a girl.. When they moved to Brooklyn and the divorce happened Grandma Dora eventually re-married and had two more children. My uncle Jesse and aunt Roz who was ten years younger than my mother , just like me and my sister who is ten years older than me. I don’t know how long they were married, but my mom told stories about growing up with a stepfather who would not even allow her to take an apple from the fruit bowl. She also tole me about having to take streetcars in bad weather to get to her fathers house so she could get some money to buy a pair of stockings. I guess that is why she never finished school but went out into the business world. My mom loved shoes and hats and gloves and all things that she worked for. Wait I am writing about the grandparents..I loved grandma Dora as if she was my mother. She took care of me while my mom went to work from the time she moved in with us..maybe when I was 6 months oldand we moved to a two bedroom apartment on Kingston Avenue. When she died I was about 5and they didn’t tell me. They sent me off to the Steeplechase with our neighbour Molly and her son the day of the funeral. I think I was home when she had a heart attack and was taken away in the ambulance, where she died. I have a memory of someone on the floor in the back foyer..either my mom or grandma and Lily sending me into the kitchen. My favourite story was always The Little Match Girl, and for years I thought my grandmother read it to me..but when my mom was dyingand we ha time to talk without her running off to do something else, she said ‘no!’ your grandmother could not read English, I read it to you every night, it was the only story you wanted for a long time. That was the first time I understood why I liked that story so much, it was the scene with the last match and the glow of it and the wish to be with her dear dead grandmother. That was when I saw that grandma Dora ‘s death was as if my mother died. As I was growing up I was always afraid my mother would dye, when her hair started to turn grey I asked her if it meant she would die soon, that was when she first dyed her hair..